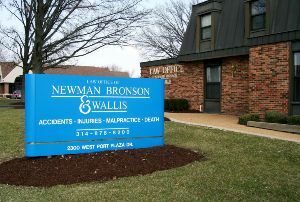 At Newman Bronson & Wallis, we represent clients in St. Louis and throughout Missouri and Illinois. We strive to provide the best possible service for our clients. We have more than a century of combined legal experience in the field of personal injury. Whether you were injured in a truck or car accident, or you lost a loved one due to a dangerous product or the negligence of a physician, we can help. Our firm is dedicated to helping injured people. If you have been hurt, contact us by phone or fill out the form below to meet with an experienced NB&W attorney to discuss your injuries and potential claims - there is no charge and there is no obligation. NOTE: Confidential or time-sensitive information should not be sent through this form. DISCLAIMER: submitting this form and speaking with any person at the firm does not establish an attorney-client relationship.